I love these 1970’s desserts. During the early years of my first marriage we hold dinner parties for friends, thinking we were ever so sophisticated, serving grilled grapefruit as a starter and almost certainly Blue Nun wine at some point! I don't remember Malakoff trifle but frequently served sherry trifle, without the jelly of course, as jelly was too common! All desserts would have lashings of piped cream swirls on top. And we were all as thin as broomsticks! Ah, those were the days! Looks amazing... My wife is a big fan of trifle. I'll pass the recipe to her. I don't remember sophisticated desserts in the 70s - apart from my very daring chocolate mousse I made once for one of my mother's dinner parties. My mother was definitely a pudding person with suet puds being her speciality. Loved them. However, had I the fortune to have come across your Malakoff Trifle, I think I would have been very happy - I certainly would be now. 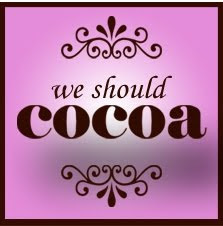 Lovely to have an entry from you for We Should Cocoa - I've missed them. Interesting to use quark and fromage frais, I'd never have thought to use them instead of cream. Sounds like a wonderful dessert! I love 70s desserts, having feasted on them for breakfast as a child the mornings after Mum threw a dinner party. Happy memories, and from how wonderful this looks I'd say it's time for a revival. I don't remember this trifle, but it looks good. One to try.